Barb Has Been a Lovely Constant in a World of Change Over the Past Ten Years. « High Blood Pressure: How High is Too High? By Katheryn Schafer, Student Pharmacist! 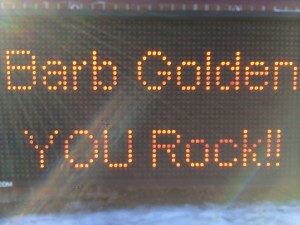 Most of you know Barb Golden, our wonderful “do everything” person in the pharmacy. 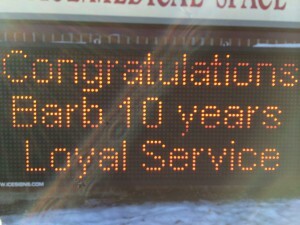 Barb started with us in November of 2003 and is celebrating 10 years at the pharmacy this month. We want to thank Barb for ten wonderful years. We hope she will be with us many, many more years! 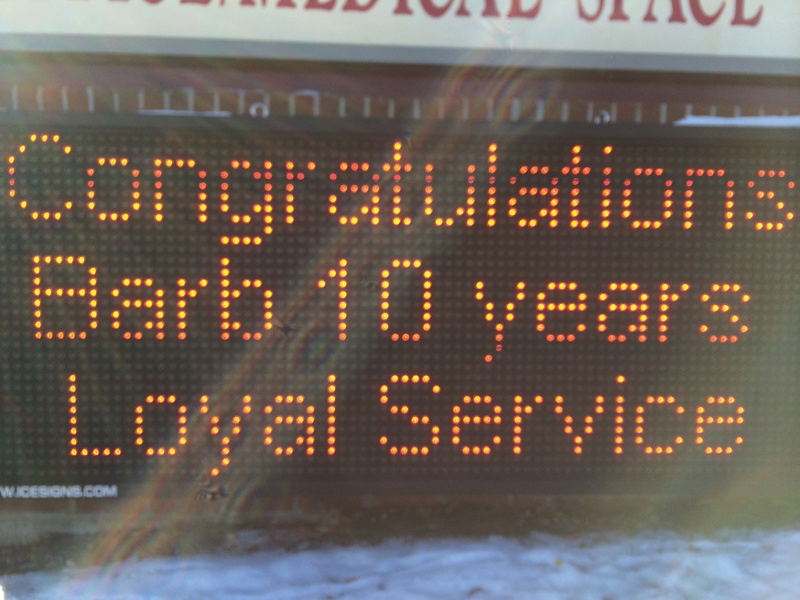 There have been a lot of changes at the pharmacy over the past ten years, but Barb has been a steady constant amongst lots of other ups and downs. I thought to celebrate Barb’s ten years, I’d list ten things that have changed since 2003 in the pharmacy (and around Plain City). 1. We moved! That is a huge change. In 2007, we picked up everything in the old store in Lovejoy Plaza and transported it to our new building. Barb and her husband, Steve, helped us with the move, which took place over the course of a weekend. We closed on Saturday and re-opened after the January first holiday on Tuesday, January 2. Phew! Talk about the longest weekend ever. I did mess up and drive to the old store on January 2. It took me months to change that habit. 2. We got the new delivery van, the giant Sprinter, which Barb was afraid to drive at first. Joe gave her a timeline of when he wanted her to feel comfortable enough to take it on deliveries. As the date drew closer, Barb asked if she could borrow the van over the weekend to practice. But when she showed up to get the van, Joe had loaned it out to someone else and it wasn’t in the parking lot! Needless to say, Barb learned how to drive the “rig” and is now an old pro behind the wheel. 3. Barb became a certified pharmacy technician. 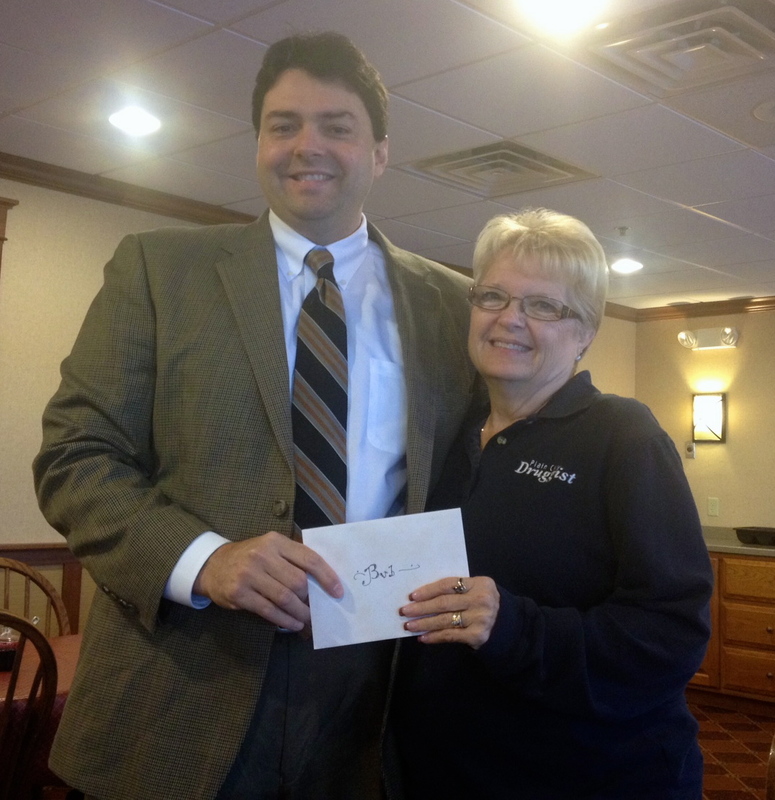 When Barb first started with us, she only did deliveries. And when she applied to work at the pharmacy, she offered to donate her time to help get medicine to those who couldn’t come in to pick it up themselves. Joe refused to let her do that, as she was doing deliveries six days a week. After she had learned every back road and side alley in the Plain City area, she started working at the register. Once she had mastered the cash register and computer, Joe decided to cross-train Barb so she could fill in as a technician. With the new Board of Pharmacy rules about pharmacy technicians needing to be certified, Barb studied up and passed her technician test on the very first try. She was so happy, Steve said she cried and cried and cried—at first, he thought she hadn’t passed! 4. The bypass took the truckers away from the downtown and off Main Street. We used to have to wash our windows at the old store almost every week due to the dust from the trucks going through. The noise from the semis was also so loud sometimes that we couldn’t leave the door open on nice days without hearing engines and tires. I have a hard time envisioning where the old road used to be now. It is difficult to imagine life before the bypass. 5. A lot of wonderful people have passed away. Steve says that every time Barb finds out a pharmacy customer has died, she comes home crying. 6. We had our 10 year anniversary party in 2009. Barb, of course, helped out with the Circus Sideshow. 7. Mary Johnson and Ann Murray both retired. Two of our other “constants” decided that it was time to stop working and step away from the cash register. 8. We expanded the compounding portion of Plain City Druggist in to its own entity, Midwestern Compounding Pharmacy. And, with that change, instead of me making all the compounds on the back counter, we moved into a giant lab in the new building. This past year, we even added our beloved Bob Borchers, RPh to the mixing crew. 9. We opened for lunch and added a break room for the staff. Ahhh, the good old days when we closed for lunch from 1:15 to 2:15 pm. Joe decided that it was inconvenient for our customers to show up and find us closed, so, this past year, we changed our hours and stayed open. Because the staff had to space their lunches and could not really leave the store like we had all done before, we made the storage room in to a break room. It’s a cozy little space with a fridge, microwave, and computer (where you can check Facebook while you eat your peanut butter and jelly sandwich). But Jan and Tony’s or Jim’s Diner, it ain’t. 10. 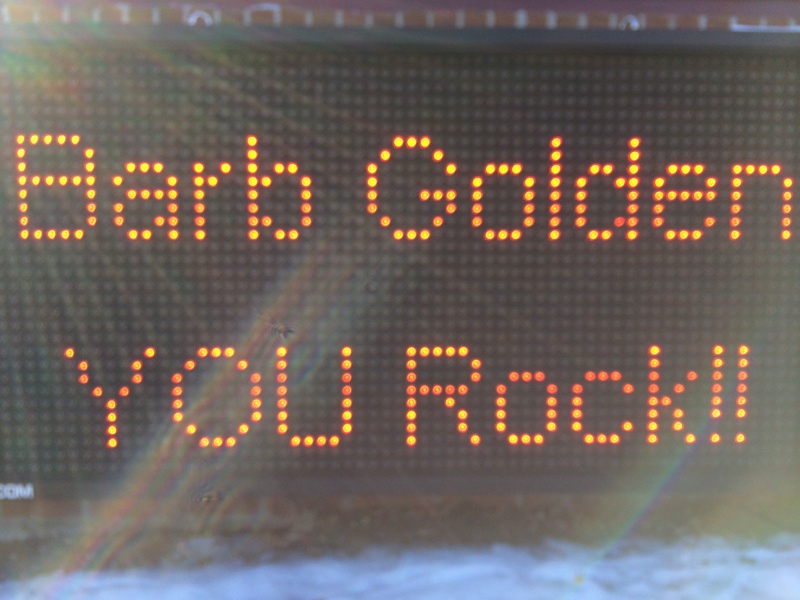 We got an electronic message board sign!! Yeah!! Hurrah! Whatever Joe is thinking about tends to end up on the sign. And he doesn’t even get as many characters to use as on Twitter. He has to be short, succinct, and to the point. But he gets your attention! Keep your eye on those red letters by the road if you want to know what is going on at the pharmacy (and in Joe’s mind). CONGRATULATIONS BARB!!!!!! How nice it is to be appreciated at your job.! Good going!